Can't attend? Follow Gathered+Styled Flower Club to know of future events! Christmas without a Christmas wreath doesn’t sound right! So join us for a workshop and learn how to make your own, using a wiring technique on a craft straw base. Decorate it with pine branches and cones, winter foliage and flowers, berries and x-mas baubles. And bubbles, as we’ll be serving champagne! 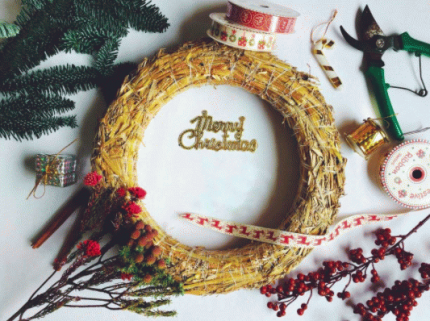 Adorn your home or make the perfect Christmas gift by learning to make your own wreaths! You'll get to bring home your wonderful creation and have lots of fun making it too. This floral workshop is open for all; no prior experience is required. Book early, limited slots are available!